Walk in and you’ll hear 1990’s to 2000’s pop music, right up our alley. You glance around the cafe and find every single staff enjoys working at Shanklin and you see a very passionate team making their guests day. They sure do crack a few jokes to their customers like me :). It was a busy day when we arrived, it was daylight savings and it was still very busy at 2-3pm. We were seated inside and we ordered their matcha latte and cafe latte. Matcha latte with honey was a little different. But there was some strong flavours of matcha. Not the ones we say perfect but close to. Latte was nice. I ordered the Potato Rosti, $22. One word: Yum! 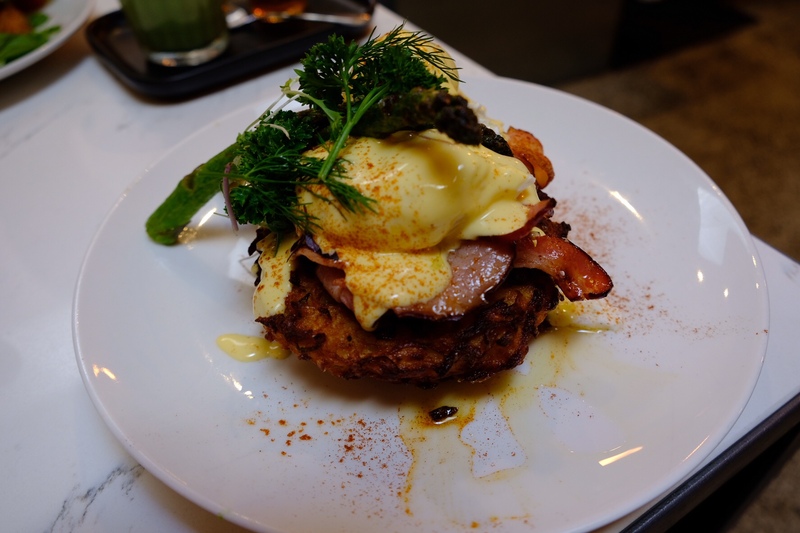 Crispy coating on the Rosti, but warm and soft inside. The bacon and asparagus were perfectly cooked. The egg with hollandaise sauce was beautiful too – I finished the dish in a few minutes! You could also choose smoked salmon instead of bacon for the healthy eaters. J had Eggs and Shanklish their signature dish, $22. It wasn’t on their menu, but the topping was a spanish cheese (feta-like) mixed with some spice. Lucky for us it was small enough to brush it away and not ruin the main dish. [We generally can’t take spicy food] I tried it, I could tolerate the spice. We could add bacon for additional $4. But J didn’t want it, he was pretty full. Overall, the vibe was fun, we had a great time. Presentation of food was colourful, could not be faulted. Taste was also good for brunch. It’s exactly what you need for a good day out. The weather worked well too. Try it and you’ll know what I mean by a passionate team.